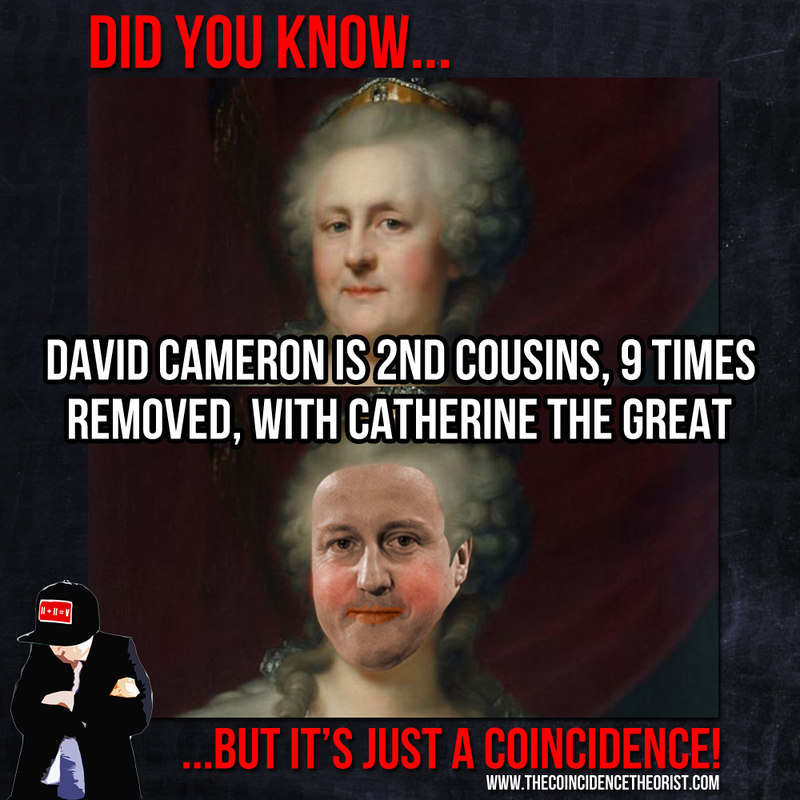 Democratically elected Prime Minister David Cameron just happens to be a direct descendent of King William IV. This makes him fifth-cousins with Queen Elizabeth II. 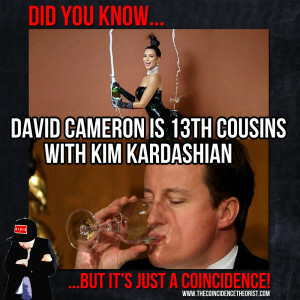 Against all odds, Cameron’s wife Samantha is 11th cousins with Queen Elizabeth II. She’s also a descendent of King Charles II and a distant cousin of Diana, Princess of Wales. 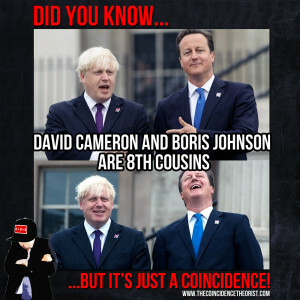 In fact, through their common descent from James I, David and Samantha Cameron are distant cousins with each other (David via William IV and Samantha via Charles II). 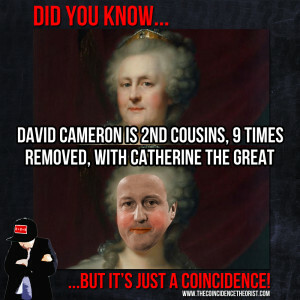 In 2013, The Spectator revealed that Cameron is second cousins, nine generations removed, with 18th-century Empress of Russia, Catherine the Great. 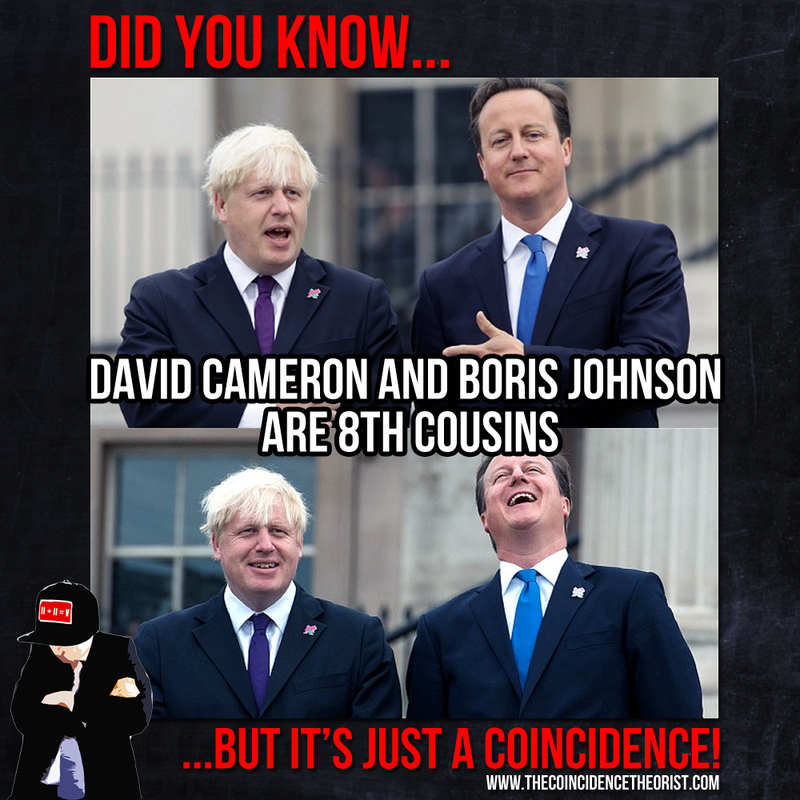 Cameron is eighth cousins with The Mayor of London, Alexander Boris de Pfeffel Johnson, through their common descent from King George II. 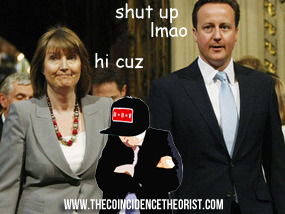 Although they are often depicted as political arch-rivals, Cameron is actually cousins with Labour deputy leader Harriet Harman. The pair are related through Harman’s aunt, Elizabeth Harman. In early 2015, comedian Al Murray pledged to stand for Parliament against UKIP leader Nigel Farage. 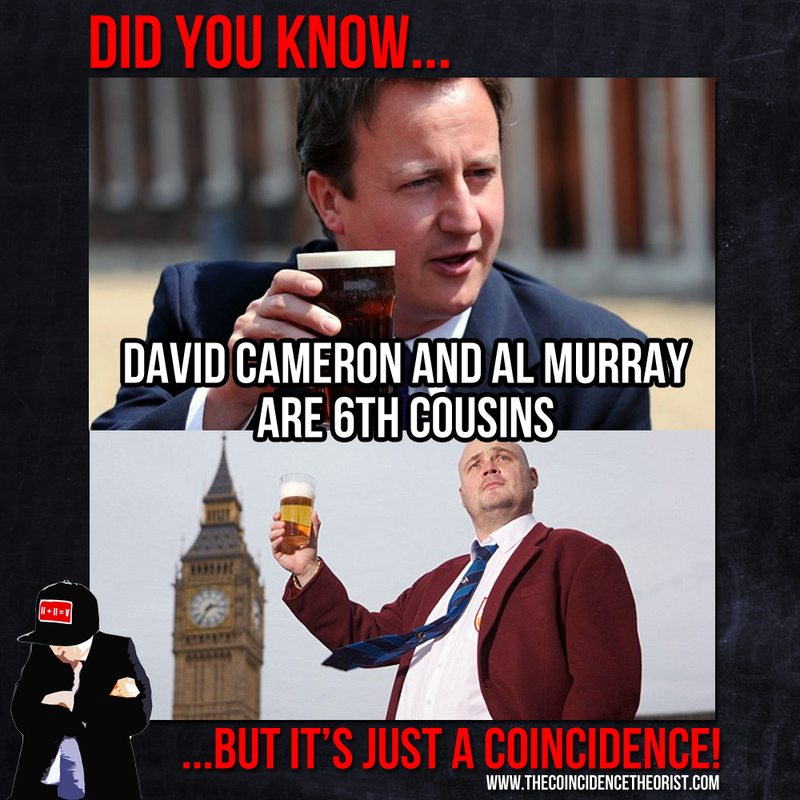 Ironically, even those who backed Murray as a protest vote were still voting for another one of Cameron’s cousins. As revealed by findmypast.co.uk, Cameron and Murray are sixth cousins, linked via the 19th-century novelist William Thackeray. “The fact that even fringe candidates (aiming to parody the mainstream candidates) are blood-related to the very mainstream candidates that they’re supposed to be parodying doesn’t bother me,” says The Coincidence Theorist. Cameron shares a 16th-century mutual ancestor, Sir William Spencer, with Kim Kardashian. This makes the pair 13th cousins. 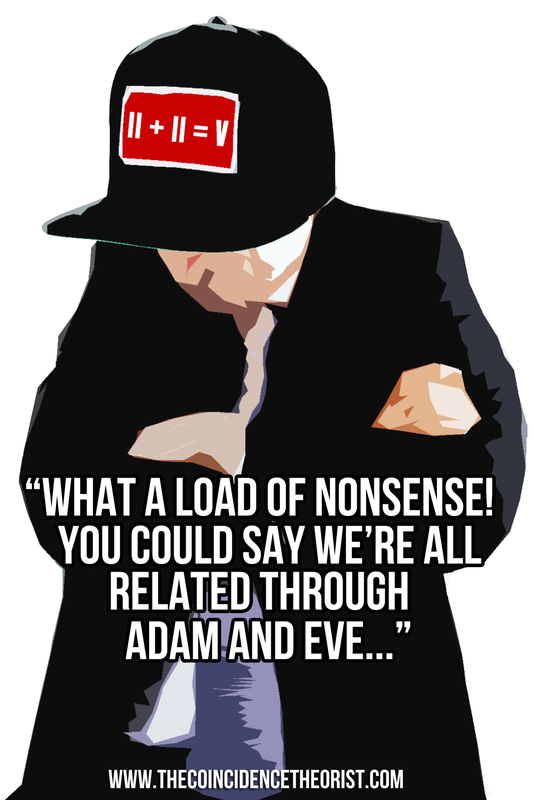 “This definitely doesn’t seem massively ridiculous to me,” says The Coincidence Theorist. For hundreds of years, the Astors were considered one of the wealthiest families in the world. They still wield significant, yet perhaps more subtle, influence today. Cameron is linked to the Astors through his wife Samantha, who is the stepdaughter of William Waldorf Astor III, 4th Viscount Astor. Unbeknown to most, Cameron also descends from an illustrious Jewish bloodline. His great-great-grandfather was German-Jewish financier Emile Levita. Levita obtained British citizenship in 1871 and was the director of the Chartered Bank of India, Australia and China (which thrives today as Standard Chartered). According to The Telegraph, Emile’s son, Arthur, a stockbroker, married Steffie Cooper, a cousin of the Royal Family, linking Cameron with Hanoverian monarch George III. The sheer extent of Cameron’s Jewish heritage was unearthed in 2009 when Dr Yaakov Wise, of Manchester University’s Centre for Jewish Studies, traced Cameron’s family tree back to the 16th-century Jewish scholar Elijah Levita. Levita is considered to have penned the first ever Yiddish novel, as well as various other significant works of literature. Dr Wise has even stated that Cameron could be a direct descendent of the biblical prophet Moses. Cameron has been linked with Scottish nobility, as his family can claim descent from the Medieval Earls of Fife. Cameron’s father, Ian Cameron, was a senior partner of the stockbroker and investment firm Panmure Gordon (following the family tradition). Incredibly, Cameron’s other great-great-grandfather, Sir Ewen Cameron, was the London head of the Hong Kong and Shanghai Banking Corporation (HSBC). Records show that Cameron and his wife are both descendants of slave owners. Their ancestors received massive payouts as compensation for their loss of property when slavery was abolished. 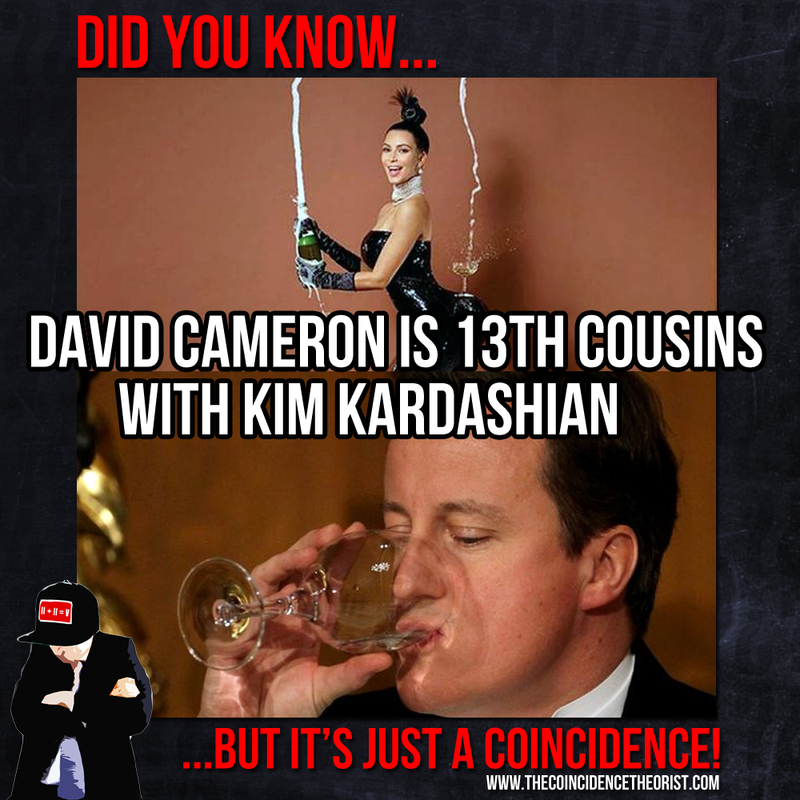 Cameron has many more notable relations but unfortunately you will have to research them for yourself. There are more than enough coincidences in this article already! Keep it in the family eh?. It seams if one is related to these parasites it gives one a ‘right’ to be successful. Makes me sick. I have never heard it mentioned but I believe David Cameron is also a direct descendant of Richard lll by his sister Ann of York and also a direct descendant of John of Gaunt both through his 4X great grandfather John Talbot Shakespear. With the reburial of Richard lll last year I am surprised there was no reference to David Cameron’s connection. Why hasn’t anyone asked the question : Why did cameron fix the Brexit referendum day in the middle of a major soccer tournament when nationalism would be at its peak. His investment bank and hedge fund connections would short sterling on his behalf. What a scam artist. 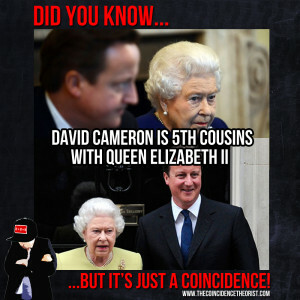 Cameron is 4th cousin of queen elizabeth – if you look at the line of queen mary, wife of king george 5. And to my opinion, cameron looks very much like catherine the great!!! At least in those pictures.